After several sequels, a prequel and a different TV series, Kevin Bacon is returning to the Tremors franchise. After 27 years, a new TV series about the giant, killer sandworms, known as Graboids, is heading to TV and, after some months in limbo, it looks like the project is headed to SyFy. The network is going to make a pilot and, if all goes well, the new take on Tremors will go to series for at least one season. The news comes directly from Kevin Bacon, as reported by Screen Daily. The actor was recently attending the Edinburgh International Film Festival, which is where he revealed that SyFy, formerly known as the Sci-Fi Channel, is doing the Tremors TV series, with Blumhouse's Jason Blum (Paranormal Activity, Get Out) producing. Here's what Kevin Bacon had to say about returning to the character of Valentine McKee after more than 25 years. "It's the only character I've ever played that I was interested in exploring 25 years later...It (Tremors) is a really good movie. I don't go back and watch my movies but because we were doing this one, I had to go back and look at it. It's just the idea of this loser who is living a very ordinary life and has an extraordinary experience with these monsters and becomes, for a moment, a hero." Despite Kevin Bacon's absence from the Tremors franchise since the original 1990 movie, the series has been quite persistent. Tremors 6 is set to arrive on January 30, 2018, which features Michael Gross as Burt Gummer, who has been present for every Tremors project since the original. He even appeared in the prequel, Tremors 4: The Legend Begins and the 2003 TV series. Interestingly enough, both of those projects were done for the Sci-Fi Channel. With that in mind, it makes perfect sense that they are going to produce this new Tremors show, especially since Kevin Bacon is on board. It isn't clear if Michael Gross is going to appear in this show as well, but that is where things could get a little complicated. Up to this point, the Tremors canon has been pretty much consistent. Since Kevin Bacon is playing Valentine again, does that mean this show will adopt all of the continuity of the other movies? Or is it going to act more like a direct sequel to the original? 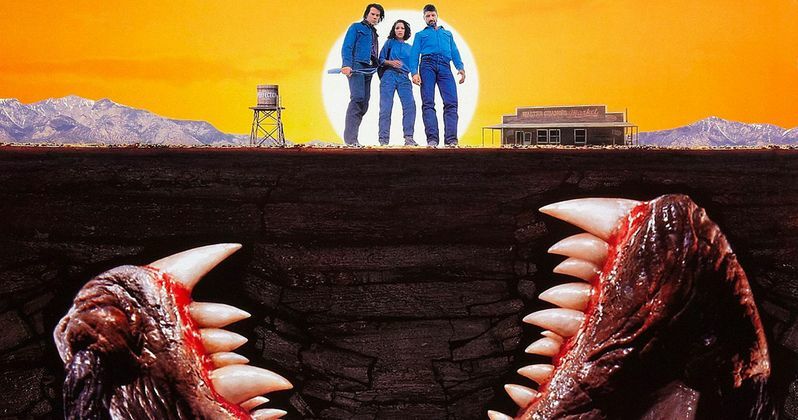 For the most part, there wouldn't be much of a reason for the new Tremors show to throw out what the other movies have done, since they all pretty much just involved people killing giant worms. Plus, it would allow for other characters, such as Burt Gummer, to return. It sounds like things are in the relatively early stages at SyFy right now, but with a network attached, things should get moving now. Assuming the pilot goes well, the plan is to have this be a miniseries, when last we heard from Kevin Bacon about it. Let's just hope the Tremors TV series can budget out some sweet practical Graboid creature effects.